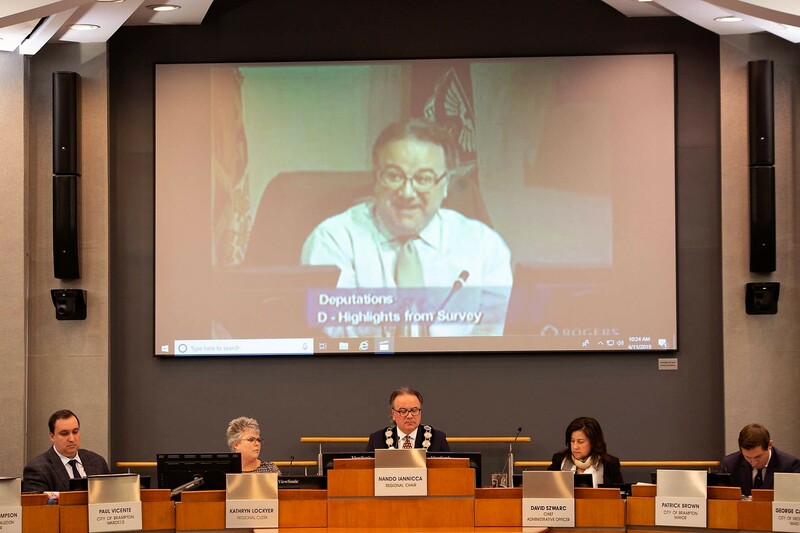 The meeting began with a disembodied image of former Ward 7 Mississauga Councillor Nando Iannicca on a giant screen as he says in all earnestness how much he dislikes his city’s place in the Region of Peel. Meanwhile, directly below the screen sits the man himself, live and in full blushing colour, and obviously uncomfortable because around his neck hangs the chain of office identifying him as the current chairman of the aforementioned region. That seemed to jar the sensibilities of those in attendance at Thursday morning’s Peel Region council meeting – including the 24 lawmakers gathered around the semi-circle and representing its three jurisdictions, Brampton, Mississauga and Caledon. The moment was almost Orwellian. This is just the latest surreal moment in a tri-party partnership that began in 1974 as a Three Musketeers-like experiment (all-for-one, one-for-all) based on economic expediency, that has now devolved into an unholy alliance (Mississauga’s view) and exemplified by Thursday’s mock trial, and the “gotcha” moment, when Iannicca’s past comments came back in all its haunting detail. Mississauga Mayor Bonnie Crombie and her councillors were outraged that their former colleague and fellow resident used his considerable might as chair to order up a report by consulting firm Deloitte and another from an outside firm (at a total cost to taxpayers of $325,000) which is now being used as a tool to show the region is the ultimate governance model that works overtime for the betterment of all its partners. “This,” they charged, “was pure politicking,” and not part of the chair’s more sublime mandate: to act as a neutral referee in this three-ring political circus. 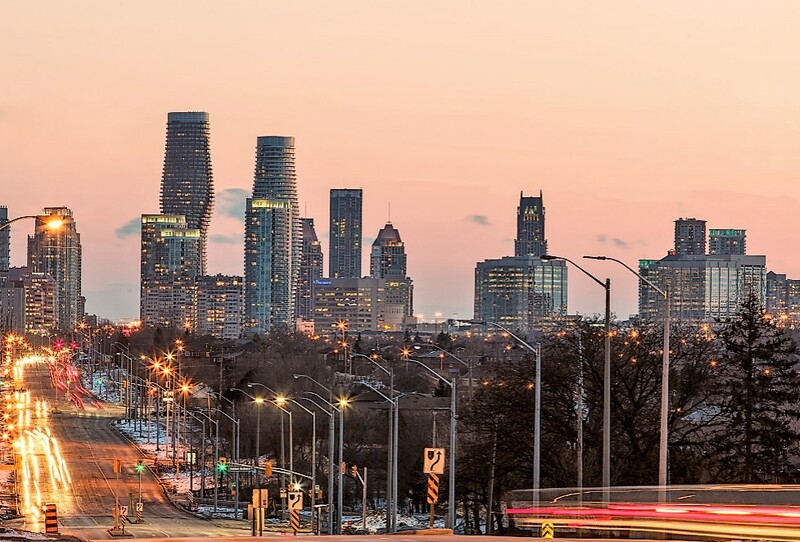 Especially now that Mississauga has expressed its desire for independence as the Ontario government studies all options in a cross-province review of the regional governance model. They also didn’t like that the Deloitte numbers were used by Brampton Mayor Patrick Brown to live-tweet Monday night as Mississauga held a Town Hall meeting to discuss these options, and use its own numbers (compiled by city staff) to state its case for becoming a single-tier city. Staff reckoned the cost to Mississauga taxpayers to stay in the region was a not-so-cool $85 million annually. This stirred up a hornet’s nest of comments from the delegations that night, and those watching the live feed on Facebook. Brown called out the Mississauga numbers by comparing them to the Deloitte ones, and this irked Crombie both Monday night, and again Thursday morning as they sat only a few feet apart. She said Iannicca had overstepped his duties as a so-called neutral player, and the Deloitte report was completed and paid for without her city’s knowledge or input. Those two meetings have been duly reported here in The Pointer, but what hasn’t been, is the emotional build-up that led to the fireworks on Thursday, or where this all might lead over the next couple of months. The Mississauga numbers were updated from a third-party report prepared for council way back in 2003 when Hazel McCallion was mayor and an outspoken critic of the region. The report said Mississauga was overpaying by $32 million per year as Peel members. She would later use the $32M as lighter fluid when she met in private with then-Premier Dalton McGuinty two years later. It backed up her argument that it was way past time Mississauga joined cities like Toronto, Ottawa, and even Thunder Bay, with one seventh the population, as independent cities. In the summer of 2005, four busloads of outraged Brampton citizens travelled to Queen’s Park to protest the second reading of The Regional Municipality of Peel Act (Bill 186), which was in effect, cooked up by then-Premier Dalton McGuinty to placate McCallion. While it upped Mississauga’s representation and buying power on regional council by two seats and Brampton’s by one, what she wanted was full-blown independence. Brampton mayor Susan Fennell was joined by Caledon mayor Marolyn Morrison in protesting both inside and outside the legislature, and a day of juicy theatrics was forced indoors when torrential rains led to an impromptu press conference. But nothing could stop passage of Bill 186, which in the end, satisfied absolutely no one. The fiery Fennell, who was always quick to blame everyone else for her ineffective leadership (especially Liberals), told a packed pressroom, Bill 186 was a “made in McGuinty-land solution.” In a city press release issued by the City of Brampton, she noted: "This Premier gave me his word that governance was not on his government's agenda. I want to believe that this Premier's word is gold, not coal." Fennell captured the contempt felt by many in the city of 420,000 (now 50 percent bigger) and some of it was shared by opposition members in the legislature. There was concern that any growth in population in Caledon or Brampton wouldn’t be recognized by the numbers of seats held at regional council – or by the province. Bill 186 followed a government report that said Peel restructuring must be based on consensus. In October 2004, Justice George Adams was hired to mediate a resolution to Peel’s restructuring. In December, he delivered a report recommending two more Mississauga regional councillors and five for Brampton. But after McCallion met McGuinty, the numbers shrunk and Brampton quickly came to realize it would remain a diminished state. Currently, Mississauga has 12 of the 24 Peel Region council seats, Brampton 7 and, inexplicably, Caledon, with about 5 percent of the population, has 5 seats, more than 20 percent of the council representation. The Flower City, whose population will catch Mississauga’s in the next decade, is the clear loser in this outdated and inequitable arrangement. Horwath was back in Brampton earlier this year leading a town hall discussion on why the province is coming up dangerously short in funding healthcare in the city, especially in creating more bed numbers at Brampton Civic Hospital. Again, the animosity at Queen’s Park in 2005 was a natural extension of what has gone on for years, and Thursday’s bad blood was very much one of the results of the Queen’s Park protest. The anger has been building up for years. But Brampton leaders have failed to address the need to have more representation around a table where much of the city’s future is decided. Fennell pledged in 2010 that she would fix the problem. But she was so embroiled in her own self-made scandals and petty leadership, focussed on favours for friends who helped pump up her brand and a constant barrage of self-promoting efforts, that the term came and went with nothing. When she did broach the issue, it was too late. The province told her and the rest of regional council that if changes to Peel were needed, they had run out of time to get them done before the 2014 municipal election. Linda Jeffrey was equally ineffective. Even with a sympathetic Liberal government, which she had been a member of as an MPP and cabinet minister, her leverage at Queen’s Park was wasted. Ford is a different animal for those trying to calculate the province's moves. He doesn’t care about election cycles and the ideal timing for change. We know what he did with Toronto, gutting its council mere weeks before the October municipal election. It would come as no surprise if any changes to Peel, even its termination, happen immediately after this summer’s provincial review of regional government across Ontario comes to a conclusion. On Thursday, after the Iannicca video was shown, he said his views since his days as a city councillor critical of regional government have “evolved.” Mississauga Mayor Bonnie Crombie said the Deloitte report’s creation was “immoral.” And Patrick Brown bristled when it was charged that the report was leaked to him. Caledon councillor Annette Groves said sure, everyone should have been kept in the loop about the Deloitte work, but the chair was just looking out for the best interests of the region, as he is mandated to. Iannicca practically admitted that his recent efforts to save his job might well be futile. “We all have our opinions on how this is going to unfold,” he said Thursday, under attack by his former Mississauga colleagues. Perhaps these next words were meant as a salve, after clearly going behind their backs on the Deloitte report. What he suggested, whether he was being genuine or not, is that Ford is moving toward a single, super-city that will at the very least marry Brampton and Mississauga (it’s unlikely Caledon would have a spot at the altar). But Iannicca could be miscalculating things, given the latest telling revelation by Ford. 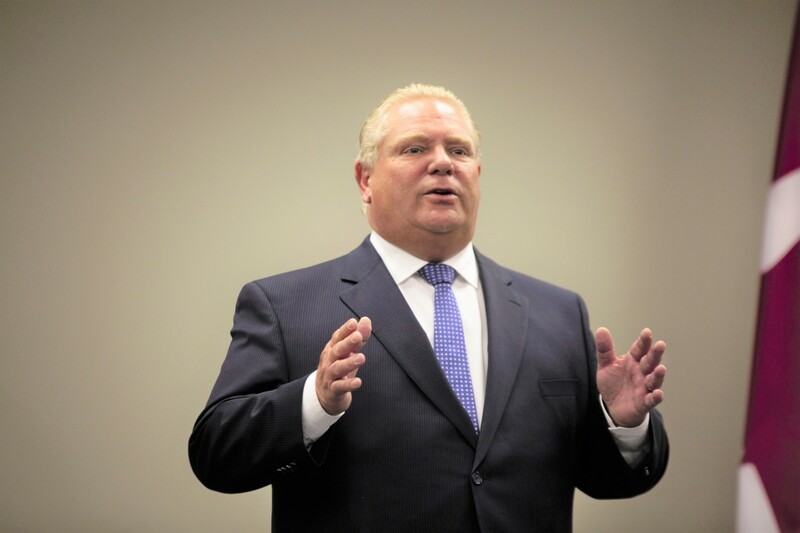 A speech delivered by Ford to the Burlington Chamber of Commerce last week suggests yes, Mississauga will finally get what it has wanted for decades, its independence. Okay, let’s decipher that and his earlier suggestion that a city with more than 700,000 residents needs to stand alone, as a yes for Mississauga independence. But if McCallion and Crombie and all their residents get a divorce, instead of a different type of marriage, what would that mean for Brampton? While emotion was rubbed raw Thursday, a resolution was later offered by Brown in a new report to be created with objective input by all four parties around the regional table, the three municipalities and Peel. There’s no doubt where Mississauga stands in all this. The arranged marriage is now choking on exhaust fumes and needs to be sent immediately to a divorce court for a final settlement. Fortunately for them, and unfortunately for Brampton and Caledon, the judge and jury in this case is likely to be the hard charging premier of the province who has already shown a predilection to hack to death anything perceived to be too much government. It was less than a year ago that he pulled from his scabbard a rather sharp sword and without warning or public consultation, sliced in half Toronto city council. Then, to emphasize this wasn’t a one-off, he again ignored public consultation and killed any chance for a public vote in selecting the next chair of Peel region council – or any of the other jurisdictions targeted by the province. We haven’t seen this much political bloodletting since Year 1, Episode 1 of Game of Thrones. • simply reform the regional model and end what critics call a wasteful duplication of services. Fenn-Seiling could also come back with a whole bunch of hybrid solutions that include a mix-and-match of all four. It’s unclear if their report, which is scheduled to be presented in June, will inform or change Ford’s final decision, or be used as a prop to back up what he already wants: a total trashing of regionalization. It’s pretty clear Ford won’t be making his choice in a vacuum. Fortunately for Mississauga, and unfortunately for Brampton and Celedon, the person who has his ear is a 98-year-old urban icon with a record as an outlier and once ruled Mississauga by an iron fist for 36 years (1978-2014). Yes, Hazel McCallion, the long-time region hater and Machiavellian figure who, despite her size (5-foot-1, in heels) and age, still carries enormous political oomph, especially with Ford. She consulted for him during his winning campaign to oust the Kathleen Wynne-led Liberals last June (a task that a bag of bricks could have accomplished) and, after turning down a role as an official consultant to Ford, has stayed on in an unofficial capacity as policy whisperer. For many in Brampton and Caledon, she is still the evil Madame X who has fought a frontline battle to extricate her adopted city from a partnership she long ago dubbed wanton, wasteful and unwanted. They charge that she, and not McGuinty, was the architect of Bill 186, and even if it never fully sated her desire for independence, surely her friendship with Ford now, will turn the trick. While McCallion’s contempt for two-tier local government is well documented, Ford’s are more mysterious, although slicing Toronto council in half and eliminating voting for regional chairs are fair indications that he, like her, is not a fan. Since the outdated but useful Municipal Act was enacted, it has delineated the political power structure in the province and allows its premier (now backed by his hefty majority at Queen’s Park) to dictate how cities or regions will be governed. Again, this does not bode well for Brampton. Ford’s penchant for pruning politicos from payrolls might only be trumped by his need to leave a legacy for his friend Hazel. After all, her support gave him credence to his leadership bid, and resulted in a majority electoral win. He also dislikes the current mayor of Brampton, Patrick Brown, who once headed the PC party in Ontario and was poised to be the next premier until charges of sexual improprieties, led to his outright denials and his dethronement as the premier-in-waiting. Brown’s tell-all memoir, Takedown: The Attempted Political Assassination of Patrick Brown, eviscerated the inner sanctum of the PC party elite, and ticked off Ford so much his response was too graphic for public consumption. But, in a striking political pirouette, Brown won the mayorship of Brampton. The surreal sidebar to all this is that both men now claim McCallion as their political mentor. Does Ford’s view of Brown, and Hazel’s view of regional government, ensure that Mississauga is finally set to win its independence? After Thursday’s regional council meeting, ending in compromise in the form of an upcoming third-party assessment on all the possible outcomes objectively measured with input from all concerned parties, Mississauga’s outspoken Ward 5 Councillor Carolyn Parrish, said she believes the entire session served a good purpose. Agreements between the warring parties in Peel have been in short supply in recent years. Does that mean the jury is still out on future prospects for the region’s Three Musketeers? Will a super-city emerge, angering both Mississauga and Brampton’s politicos, and residents whose cities will lose their identities? The identity question has been surprisingly absent for most of the debate. When six constituencies were amalgamated to create the current City of Toronto 21 years ago, the driving argument against the inevitable move by the province, was a passionate call to arms by residents frightened about the specter of losing their sense of community. Of themselves, in many ways, and where their roots were, how they had been shaped and understood by all the things community represents. In Peel, it’s mostly been about the numbers, not how people actually feel, in their bones, about losing a big part of their sense of place. Maybe this isn’t surprising. Brampton and Mississauga have grown too fast. For many of the almost 1.4 million residents, their sense of identity is tied to places far away. Many of the commuters who pour in and out view these cities, the ninth and sixth largest in the country, as little more than a blur. There is little that civic leaders, including generations of long-time residents, have done to stitch together a rich, seamless tapestry, as enclaves and subdivisions have instead been snapped into place like removable pieces of Lego. Fenn-Seiling might come up with a hybrid, a super-city that could be hyphenated like Kitchener-Waterloo. After all, Seiling was around at the time of its composition, a marriage that many in those two previously independent communities still loathe.